German Tin Toy "Gustav the Miller" by Lehmann.18" (46 cm.) 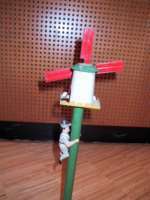 A white-suited tin miller is climbing a green pole with a windmill at the top. 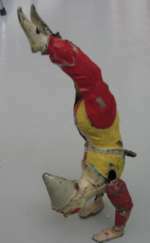 Upon reaching the top a weighted tin "sack with flour" drops to his head, causing the windmill blades to turn, and the man to descend the pole with realistic movements of his arms and legs. Excellent condition. Lehmann, EPL model 230, the toy was introduced in 1890. This piece is from ca 1910. Schuco bird. Wonderful colours.The contions is fine,but the wind up is not working..
Mekanical Pluto tin toy made by Marx toys. 1939. Comic. Disney. 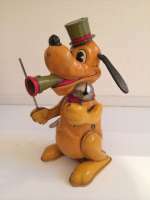 Disney.Comic/movie tinplate toy from about 1939.Marx,USA.The toy is in good condition.Working when with clockwork. Busy Lizzie-mechanical tin toy lady rare version from Distler,Germany. 17,5 cm/7".Buzzy Lizi mechanical tin toy lady from Distler,Germany.About 1925. Wind up. When Lizzie is wind up,she cleans the floor with great energy Very good condition.Wonderful colors!This is a rare model made by Diestler! ( you mostly find the Fischer Toy). A charming old tin toy.Size:H= 7 1/4 inch/17,5 cm. 2 monkeys made by Distler,Germany.About 1930.Wind up toy.Very good condition.The flag is not original. Handpainted toy from Bing Germany.Made about 1900.A wind up toy.A very nice and rare piece.Good condition.You can find more about the toy in the book of Reinhold Blechner" Clowns auf Tour".This type of Clown is made by different factories.The Clown from Bing is a little bit bigger than the others.When wind up, he is walking on his hands. Size: H= 24 cm/9,5 inch. Pluto als Musiker. Comic. Disney. Pluto als Musiker. Schön lithographiertes Blechspielzeug. Uhrwerkantrieb. Wenn aufgezogen, spielt er und bewegt sich. Um 1940 von Firma Marx hergestellt. Sehr guter Zustand. H: 15,5 cm. Beatle from Japan.Made about 1965.Wind up toy.Near mint condition.